The Clip ’N Dales open the Snowdown 2018 Follies during Media Night on Tuesday at Durango Arts Center. The Editorialist is played by longtime Follies actor Roc Simmons. The guys formerly known as The Danglers (2012) or The Laptops (2013) have morphed into a barbershop quintet. 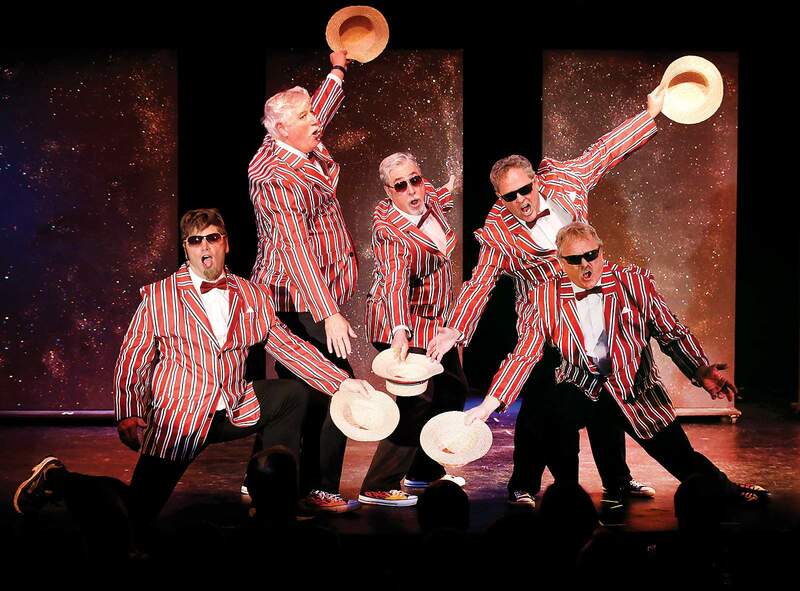 Smartly dressed in striped blazers and straw boaters, The Clip ’N Dales – Paul Gibson, Chuck Fredrick, Steve DeBelina, Dave Culver and the inimitable Dan Imming – opened Snowdown 2018 with a smart, well-dressed song and dance. Once upon a time, they opened the Follies dressed only in suspendered barrels or laptops strapped on like G-strings. They lamented rural love or delivered bawdy tips on PowerPoint presentations. Question: Has a midlife crisis set in for Snowdown at 40? Answer: No. There were enough old Snowdowners at the media preview to hold out hope for continuing our mid-winter bacchanal. The upstarts added a certain flair. But on balance, we could stand edgier local news and nattier celebrity taunts. Longtime hosts Rebecca Gilbert (23 years), Lisa Zwisler (15 years) and Sandra Shellnut (12 years) gave newcomer Derek Ryter (two years) some tips on how to host an evening of nonsense. They rolled out and sustained a few joke lines to mixed effect: Gilbert’s Goldmember, Shellnut’s boot bra and Zwisler’s Wodka. Local politicians got a few swipes, the city council and county manager, the proposed sewer plant, the “dump pump,” not to mention ongoing stings aimed at public art, the Broncos or naming north Main North Main. Trash talk used to be the staple of Snowdown. Bring it back. Stalwarts to remember: Lisa Govreau (18 years) led a Handmaid’s “Tail” trio with smiling knowingness and a lampshade for a hat in “You Don’t Own Me.” Jonathan Hunt (14 years) hilariously lip-synced “She’s Hot” at El Rancho’s last call. David Imming (15 years) sauntered on stage a-la Sinatra and lip-synced a medley of torch songs with oily aplomb. Remember his Jersey Shore Frankenstein back in the day? The guy gets a laugh just walking on stage. And once again, Roc Simmons seems to be the uptown outlier at Snowdown. Simmons (30 years) keeps coming up with fresh takes on old skits. Over the years, his newscaster, The Editorialist, has turned local headlines into rolling jokes with various announcer partners. 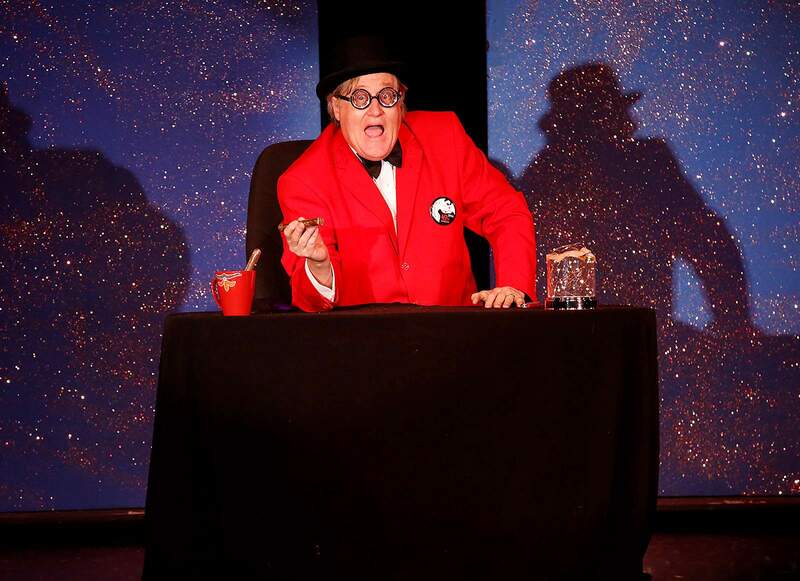 This year, Simmons delivered a solo channeling Jerry Lewis in a musical mime skit from his 1960 movie “The Bellboy.” Costumed somewhere between Churchill and FDR, Simmons delivered a savvy news report without words – entirely through gestures – mimicking trombone slides, muted trumpets and jazzy drums. Yes, it was masterful. Watch and learn. May the multitude of younger Snowdowners take a cue from the old-timers like Simmons, Gilbert, Zwisler, Shellnut, Staten, Govreau, Hunt and that master of British music-hall humor, Baudi Shellnut (nine years).